The hardest part of making political commentary in a narrative film is being subtle about it. Having one’s opinion on display in a dramatic film and making sure that it doesn’t come off as preachy or overt from any angle is incredibly important and equally difficult to pull off. For the most part however, Ramin Bahrani’s new film “99 Homes” does an effective job of keeping its message about the housing crisis and capitalism as a whole in a strictly “show not say” manner. Still an independent director, this film additionally sports quite the cast of mainstream actors compared to much of his previous work. And that is exactly the sentiment the film begins with. Rick Carver is a real estate shark simply doing his job, going from house to house to deliver sad news to sad families: their houses belong to the bank now. The interesting part however is that Carver feels little for the news others might dread delivering. Shortly after evicting a young man named Dennis as well as his mother, Carver decides to hire Dennis to clean out recently foreclosed properties with him- the point at which the seedy underbelly of the government’s involvement in the housing crisis gradually reveals itself. This exposure would mean little if not portrayed in an honest and informative manner, and director Ramin Bahrani for the most part succeeds in this regard. Bahrani does an excellent job of putting on display the government’s shady tactics (such as using Dennis to clean out appliances so the government pays to replace them) as opposed to merely referencing them. This film’s issue doesn’t quite lie with how subtle Bahrani is with his commentary, but rather how the film has a slight tendency to lose its message in the midst of needless thriller cliches towards the film’s end. It is understandable for a film this informative to not have very much meat on its plot bone, but it is still certainly unfortunate that the film’s message has to suffer as a result. Thankfully the performances more than make up for this drawback. Andrew Garfield gives quite the surprising performance as Dennis Nash, proving once more that losing his accent is nowhere near a problem for him. Michael Shannon provided quite the impressive performance as a cavalier, self-interested, and arguably sociopathic Rick Carver- the polar opposite of Garfield’s character. While these two actors are for the most part the film’s only legs to stand on, they are more than sturdy enough to last. The sick feeling left in most every viewer’s stomach will likely be the best indication of this film’s success. 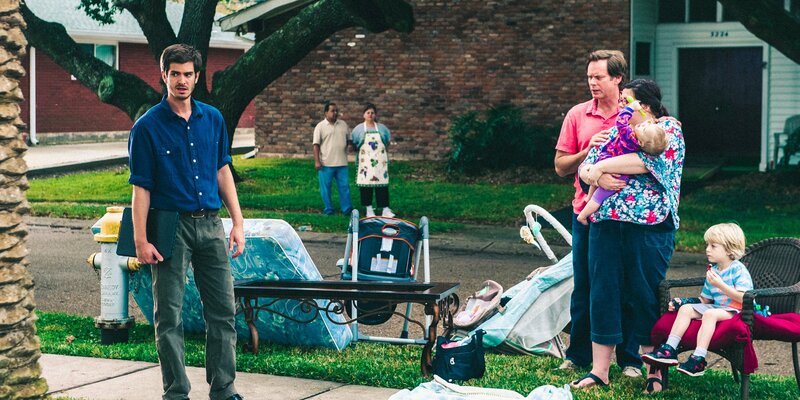 “99 Homes” ultimately does a great job of showing what is wrong with the government’s role of seizure in the housing crisis instead of simply telling. This entry was posted in Articles, REVIEWS and tagged 99 homes, andrew garfield, housing crisis, michael shannon, ramin bahrani, review. Bookmark the permalink.